Damage to the jaw and temporomandibular joint (TMJ) frequently occurs in motorcycle accidents, whether or not a helmet is worn. 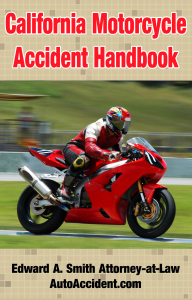 As a Sacramento motorcycle accident attorney, I see many Jaw injuries from motorcycle accidents. TMJ stands for “temporomandibular joint” and is the joint that allows you to chew, talk, and open and close your mouth. It is a ball and socket joint, where the ball is at either end of the mandible and the socket is an indentation in the temporal bone. The TMJ is located just in front of each ear. The symptoms of jaw and TMJ injury are about the same, regardless of the actual cause of the problem. Ultimately the symptoms are due to an imbalance in the action of the left an d right TMJ. • Spasm of the jaw so the jaw has a difficult time opening and closing the jaw. • Headaches are very common and occur in 80 percent of patients with TMJ disease. A total of 40 percent of people share facial pain. The headache is worse when the patient opens and closes the jaw. Facial pain and headache tend to get worse when the patient is exposed to a cold breeze or air conditioning. • Ear pain occurs in about fifty percent of patients with TMJ disorder and they often mistake it as an ear infection. The ear pain is usually described as being in front of and slightly beneath the ear. Because it is so common to have ear pain with TMJ disorder, it is not uncommon to have an ear doctor make the correct diagnosis of a joint disorder instead of an ear problem. • People can hear sounds when moving the joint. There can be crunching, grinding, popping, or clicking sounds otherwise known as crepitus. The sounds can be associated with an increase in pain or can be painless. • Dizziness is also a common problem. It occurs in about 40 percent of people with TMJ disorder. It’s usually a vague sense of being out of balance and usually doesn’t represent vertigo. No one knows exactly why this type of dizziness occurs. • Fullness of the ear is seen in 33 percent of cases. Patients describe the symptom as feeling like the ear is full, clogged or muffled. It is more noticeable when flying a commercial airliner that is ascending or descending. It is caused by dysfunction or hyperactivity of the Eustachian tube which is located near the TMJ. • Ringing in the ear is seen in about 33 percent of cases. No one knows exactly why this occurs. Of the people who have ringing in the ear or tinnitus, half will have their problem resolved when the TMJ is treated. Jaw injuries often happen when the disk erodes from direct or indirect trauma to the joint. The diagnosis of a TMJ or jaw injury (assuming no fracture) can be difficult. Patients have symptoms that at first appear to be related to the head, the ear or the mouth. Symptoms can be vague. There are a couple different types of x-rays that can be done to assess the function and appearance of the temporomandibular joint. Full face x-rays show the teeth and the TMJ along with the rest of the facial bones. A Panorex or panoramic view x-ray can be taken if the hospital or dentist’s office has the equipment to take one. This gives a single shot of all the teeth, the mandible and the temporomandibular joints. In other cases, an MRI or CT scan can show the detail of the TMJs. The MRI scan gets the best view of the soft tissue around the joint, while the CT scan gives the best view of the bony aspects of the joints. Depending on the results of the exam and testing, you may be referred to an oral and maxillofacial surgeon for further evaluation and management of your disease. These are specialists in the face, jaw and mouth area. • Taking anti-inflammatory medications such as Aleve (naproxen) or Advil/Motrin (ibuprofen). You can also take Tylenol or acetaminophen for pain, although this is not an anti-inflammatory medication. • Consuming a diet consisting of soft foods. • Placing warm compresses on the TMJ joint. • Doing exercises that include opening and closing the jaw from side to side following the application of warm compresses. This should be tried 4-5 times per day for two to four weeks. • You can gently massage the TMJ and surrounding area. If under a doctor’s care, you may be asked to rest the jaw and do many of the above home remedies to see if this will relieve the pain and inflammation of the TMJ. Avoid chewing gum, eating chewy foods, or eating hard candy or nuts. Don’t widely open your mouth. You will be taught how to do gentle exercises that stretch and relax the muscles, and you may be taught stress-relieving techniques. The doctor may place a mouth splint or bite plate in your mouth. You put it over your lower jaw and it prevents grinding and clenching of the teeth if worn during the nighttime hours. This automatically eases muscle tension in the jaw area. If the splint worsens the pain, see your doctor about stopping its use. There are many conservative measures you can use for TMJ disorder and most of them are successful. If they are not successful, more invasive techniques are possible. For example, there is a procedure that can be done in the doctor’s office using local anesthesia. It involves washing out the TMJ with two needles. One needle contains a syringe with cleaning solution and the other allows the fluid to exit. This cleans out the TMJ and gives many patients at least some temporary relief. Sometimes, pain medication is introduced into the joint space to provide temporary total relief. Cortisone can be injected into the joint space, resulting in a prolonged period where inflammation is suppressed. Surgery for TMJ disorder should be reserved for only the most severe cases as the results of the surgery are often irreversible. If a patient has had a fracture to the condyle, surgery can be done to make sure the condyle is in its proper position. Arthroscopy is another invasive procedure that is done. Tiny cameras are introduced into the joint and the joint is cleaned out and shaved smooth so that no irregularities can be found inside the joint surfaces. Arthroplasty is an open procedure in which the joint is exposed, the disc repositioned and the cartilage is cleaned. Finally, a total joint replacement can be done in which the natural condyle is replaced with an artificial one. An artificial socket can also be put in. It is important to recognize that open and invasive joint surgeries to the jaw and TMJ do not have a great success rate so that they should be used only in those situations where the joint damage is severe and there is a better than average chance that the surgery will improve the pain. While it is natural to want to do everything you can to ease the pain, it is important to recognize that surgery may not be the answer to what you’re looking for. Stay informed about the pros and cons of having invasive surgery so that you know you’re getting into something that will ease your discomfort. If you fracture your TMJ bones, these can heal poorly and can lead to chronic pain in the face and head, along with the other symptoms associated with TMJ disorder. Other complications can be osteoarthritis of the TMJ or chronic pain when opening and closing the jaw. It should be noted that there are a fair number of complications of surgery itself, besides the usual nerve damage, bleeding and infection. The pain can be considerably worse after surgery and there can be an increase in the popping sounds heard before the surgery. One complication of chronic TMJ disorder is the tendency to spontaneously dislocate the jaw. The jaw often needs to be treated in the emergency room by a doctor trained in relocating dislocated jaws. I’m Ed Smith. I’ve has been practicing personal injury law and specializing in motorcycle accident cases for thirty years. Call me anytime at 916-921-6400. I am a member of Million Dollar Forum, an association of National personal injury lawyers who have multiple Million Dollar Verdicts and settlements. I invite you to see what others say about their experience with our office on Yelp, Avvo and Google.